For more than 20 years, the Honda CR-V has been synonymous with efficiency and reliability for Canadian motorists. And this year, Honda raises the bar once again with its brand new, completely redesigned Honda CR-V.
From one bumper to the other, the 2017 Honda CR-V offers more features, technology, performance, versatility, and comfort than ever before while also being affordable and of course, incredibly reliable. 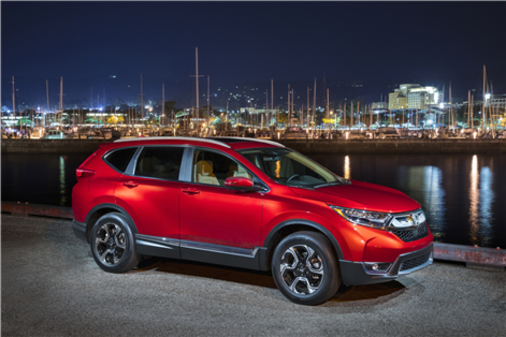 In addition, the CR-V offers a completely redesigned body that is more muscular and chiseled that gives it a much stronger presence on the road while also being elegant and refined. Can you really ask for more? Under its hood, the Honda CR-V now houses a four-cylinder, turbocharged, 1.5-liter engine that is both more powerful and more fuel-efficient than the previous-generation’s engine. The Honda CR-V, which now features 190 horsepower and 179 lb-ft of horsepower, stands out with a fuel consumption rating of just 8.4 l/100 km in the city and 7.0 l/100 km on the highway. Even with all-wheel drive, available as standard on almost every version, fuel consumption remains very frugal at 8.7 l/100 km in the city and 7.2 l/100 km on the highway. Available in four versions (LX, EX, EX-L and Touring), the 2017 Honda CR-V uses the same mechanics and the same continuously variable automatic transmission in every model. That means that even with the base CR-V starting at just $ 26,890, you can enjoy the CR-V’s impressive efficiency. Inside, the Honda CR-V adopts a new, more ergonomic dashboard and remains one of the leaders in its class in terms of cargo capacity and overall interior space. 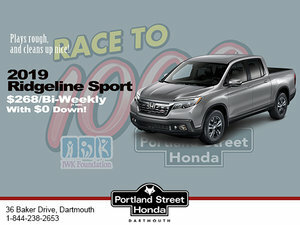 At Portland Street Honda, nothing is more important than the safety of our customers. And with the Honda Sensing technology package, the 2017 Honda CR-V ensures that you are always safe out on the road. By integrating driver assistance technologies such as front-end collision warning, collision mitigating braking, lane departure warning and prevention, and adaptive cruise control, the Honda CR-V does not only warns you of a possible accident, it can also help you avoid it. For more details on the new 2017 Honda CR-V, please visit us at Portland Street Honda. We are waiting for you!